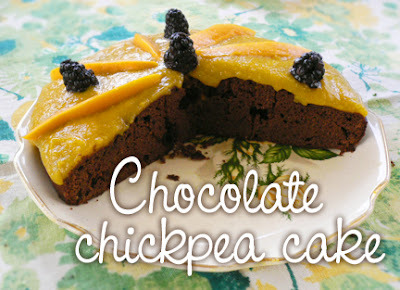 Before you say anything, this cake has not a hint of chickpea taste! Here, the canned beans replace flour entirely to create a dense, moist cake that's not too sweet and happens to be fat-free and dairy-free. The orange apricot glaze gives it a nice tang. Inspired from a recipe that appeared in an issue of Veggie Life magazine. If using hazelnuts, lightly toast on a dry skillet or in a warm oven until lightly golden. Set aside. Preheat oven to 350 degrees and lightly oil an 8-inch round cake pan and circle of waxed paper. In a food processor, puree chickpeas and orange juice until very smooth. Add vanilla, orange zest and eggs, one at a time, pulsing after each one. In a medium bowl, whisk together sugar, cocoa, baking powder, baking soda and salt. Add to processor and pulse until blended. Stir in chocolate or carob chips or hazelnuts, if using. Pour into prepared pan and bake for 40 to 50 minutes, checking after 40 to see if a toothpick inserted comes out dry. When done, let cool in the pan for at least 15 minutes, then remove and set on a serving dish. If desired, top with either glaze, a dusting of icing sugar, or fruit. *For an egg-free cake, replace with: 3/4 cup water combined with 1/4 cup ground flax seed (let stand 10 minutes to thicken before adding in the recipe); or 1 cup whipped silken soft tofu; or (if you like a chocolate banana cake) 1 large mashed ripe banana. In a small saucepan, combine orange juice and zest. Bring to a boil, then add apricots and simmer a few minutes. Remove from heat and add honey and cardamom. When cool, puree til smooth. Pour on center of cake and spread evenly, and top with mango slices and/or fresh berries if you like (delicious with raspberries!). I do eat eggs occasionally and enjoy them, though the problem with eggs is that they're rajasic -- not a bad thing, but can be in excess. Most ayurvedic sources condemn eating eggs, so to follow a pure ayurvedic lifestyle would exclude eggs. But, in one book I refer to quite a lot, it recommends eggs for Vatas, and egg whites only for Pittas and Kaphas because the yolks are so "hot" and heavy. As a Kapha you could be selective about when/how much you eat eggs, and opt for non-fried, fat-free cooking like poached or boiled (or baked) and try not to eat the yolk. yum I made this it was so good!!! Unfortunatly mine did not rise as much as yours (it actually didn't rise at all!) but it was still soo nice! Even the none health-food-eaters in my house enjoyed it!! Sometimes flat cakes are the best...!